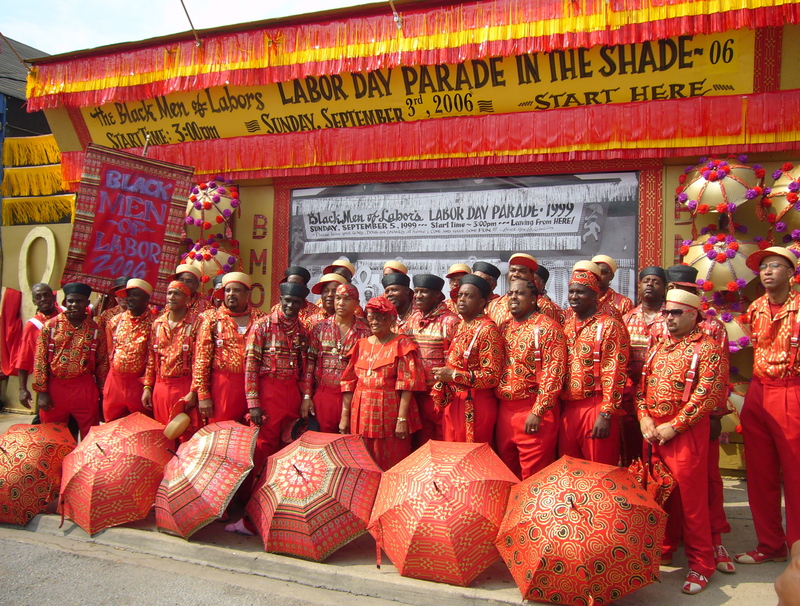 The Black Men of Labor outside their headquarters on St. Claude Avenue before the club’s parade in 2006. Listen to a radio story about Black Men of Labor, produced by Matt Sakakeeny for WWOZ’s Street Talk in 2006. The Black Men of Labor Social Aid and Pleasure Club was formed in 1993 after the death of traditional jazz musician and mentor Danny Barker. Barker introduced many young African American musicians to brass band music and the practice of playing a jazz funeral through the Fairview Baptist Church Band. Although funerals in New Orleans had long been accompanied by a brass band performance, Barker did not want a jazz funeral for himself. Changes in the way funerals were performed through the 1970s, 80s, and 90s (including dress, repertoire, and conduct) discouraged Barker from requesting a band for his own funeral. Barker believed that modern funerals failed to show appropriate respect for the deceased and the tradition of jazz funeral parades. Barker’s request surprised many musicians, including trumpeter Gregg Stafford, who played with Barker in the Fairview Band. Along with community activist Fred Johnson, Stafford convinced Barker’s widow Lu to have a jazz funeral for the venerated musician. Stafford and Johnson insisted on traditional dress uniforms for musicians (black and whites), traditional repertoire (spirituals, hymns, etc. ), and respectful conduct of those attending the funeral parade. Following Danny Barker’s funeral parade in 1993, Stafford, Johnson, and Benny Jones decided to continue the practice of having a traditional-style parade each year, and established the Black Men of Labor. The club parades each year on the Sunday of Labor Day weekend, accompanied by a large brass band dressed in traditional uniform and playing traditional repertoire. Members of the club frequently wear outfits featuring African prints, with the overall goal of instilling respectability and reminding attendees of the tradition’s historical roots.